Takeaway: We will be hosting a call on Tuesday April 17 at 2:00PM ET previewing what investors need to know about Pivotal prior to the company's IPO. Dial-in and Webcast information to be distributed prior to call. Once upon a time the management team of EMC caught lightning in a bottle and gave the world VMW. VMW changed the world of technology infrastructure and unleashed an era of software abstraction while EMC smiled, sat back, and watched the equity value of their ownership in VMW balloon. Did EMC (DELL) catch lightning in a bottle a second time with Pivotal? Pivotal is in the midst of (at least) its second business model / product transition, this time from IT Services (Labs) to Software (PCF). The previous transition was to sunset its 'heritage offerings' from 2013 through 2015 while growing Labs and starting up PCF. 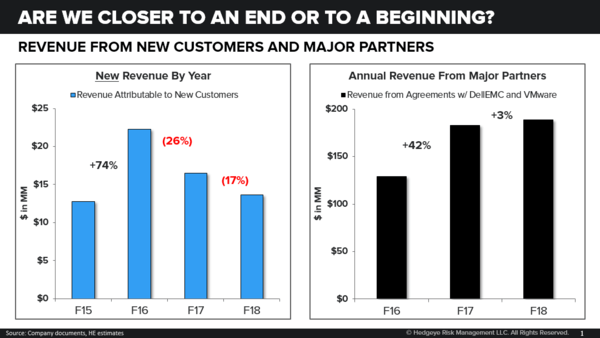 In recent years, the company has had a great run of growth in subscription software revenue. How much of that was thanks to bundled deals from EMC-VMW where large enterprise clients wrapped deals for the entire kit? Even the roadshow examples seem to hint in this direction with one happy customer noting that at the start of that company's digital transformation they already had Pivotal software in-house. Lightning in a bottle, this seems not. How far along the penetration curve is PCF? There are many large customers who sign up for the open source version of the software (Cloud Foundry), but a smaller minority actually continue all the way through to full PCF subscription software. What do they use it for? PCF is mainly used to make it easy for developers to publish code into operating environments. But, there are multiple available competing tools, including Kubernetes (for free) if engineers are willing to do a bit of work in configuration. Duration of usage? PCF customers sign a subscription contract with 1 to 3 year terms. Is that oddly brief? On the plus side, it lets Pivotal pursue VMware-like price hikes with regularity. On the downside, it requires a selling motion with greater frequency. What gives? Bullish? The company is showing a 70% increase in backlog, however the backlog is composed of RPO and deferred revenue. RPO is up 116% and deferred revenue is up 30%. Our first read is that the RPO increase reflects the time extension of service, in this case years 2+3 of a PCF contract, where billings have only occurred for year 1. Either way it is bullish but likely not indicative of an imminent re-acceleration of revenue. We think we can reconstruct F16 backlog based on data we have found so that you can see rate of change over a longer time series. Also bullish? The company hired ~800 employees in the last two years, a 50% increase in total headcount. That reads bullish to me, and hopefully implies a great long series of new product introductions in the coming years. But...the hope and the dream are not always the same. The next product that can generate revenue is Pivotal Container Service (PKS), but this seems to be a wrap around free Kubernetes so we aren't betting on big dollars from that one. In addition, Pivotal has launched product into every corner and fad of software (somewhat Oracle-like) including even a Hadoop product, but few of these adventures have returned big dollars. Lastly, we'll break down M&A and show where it has been material to revenue (growth substitution) and product (R&D substitution). We don't know yet if PVTL is a long or a short but we will do our best to get you there for Tuesday at 2pm. Final thought. If Pivotal Greenplum (database management software) was $100m (estimate) of revenue in F18...what does it imply about PCF revenue? And, why isn't it broken out in the S-1 or talked about in the roadshow?